Stewards of the Coast and RedwoodsPreservation through Education and StewardshipRussian River District State ParksVolume XXIV, Number 1, Spring 2009Mission StatementStewards of the Coast and Redwoods(Stewards) works in partnership withCalifornia State Parks to protect andinterpret the natural and cultural resourcesof the Russian River District.State Parks SupportedArmstrong Redwoods State Nat. ReserveAustin Creek State Recreation AreaSonoma Coast State ParkStewards of the Coast and RedwoodsP.O. Box 2, Duncans Mills, CA 95430707.869.9177, 707.869.8252 Faxstewards@mcn.orgwww.stewardsofthecoastandredwoods.orgArmstrong Redwoods ~ 75 YearsMichele Luna, Executive DirectorIn 1934, as part of the purchase of Sonoma Coast State Beach, Armstrong Redwoodsbecame a State Park. The history that precedes this historic event dates back toOctober of 1874 when Colonel James B. Armstrong purchased the land. Ownershipof the 440 acres that make up Armstrong Redwoodswas transferred to each of his children at differentpoints in history from 1878 to the early 1900s. By1907, the property was owned by Lizzie ArmstrongJones and Harrison LeBaron. 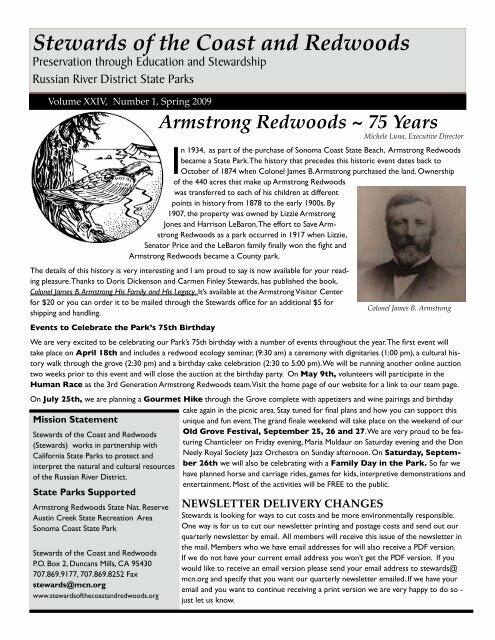 The effort to Save ArmstrongRedwoods as a park occurred in 1917 when Lizzie,Senator Price and the LeBaron family finally won the fight andArmstrong Redwoods became a County park.The details of this history is very interesting and I am proud to say is now available for your readingpleasure. Thanks to Doris Dickenson and Carmen Finley Stewards, has published the book,Colonel James B. Armstrong His Family and His Legacy. It’s available at the Armstrong Visitor Centerfor $20 or you can order it to be mailed through the Stewards office for an additional $5 forColonel James B. Armstrongshipping and handling.Events to Celebrate the Park’s 75th BirthdayWe are very excited to be celebrating our Park’s 75th birthday with a number of events throughout the year. The first event willtake place on April 18th and includes a redwood ecology seminar, (9:30 am) a ceremony with dignitaries (1:00 pm), a cultural historywalk through the grove (2:30 pm) and a birthday cake celebration (2:30 to 5:00 pm). We will be running another online auctiontwo weeks prior to this event and will close the auction at the birthday party. On May 9th, volunteers will participate in theHuman Race as the 3rd Generation Armstrong Redwoods team. Visit the home page of our website for a link to our team page.On July 25th, we are planning a Gourmet Hike through the Grove complete with appetizers and wine pairings and birthdaycake again in the picnic area.  Stay tuned for final plans and how you can support thisunique and fun event. The grand finale weekend will take place on the weekend of ourOld Grove Festival, September 25, 26 and 27. We are very proud to be featuringChanticleer on Friday evening, Maria Muldaur on Saturday evening and the DonNeely Royal Society Jazz Orchestra on Sunday afternoon. On Saturday, September26th we will also be celebrating with a Family Day in the Park. So far wehave planned horse and carriage rides, games for kids, interpretive demonstrations andentertainment. Most of the activities will be FREE to the public.NEWSLETTER delivery CHANGESStewards is looking for ways to cut costs and be more environmentally responsible.One way is for us to cut our newsletter printing and postage costs and send out ourquarterly newsletter by email. All members will receive this issue of the newsletter inthe mail. Members who we have email addresses for will also receive a PDF version.If we do not have your current email address you won’t get the PDF version. If youwould like to receive an email version please send your email address to stewards@mcn.org and specify that you want our quarterly newsletter emailed. If we have youremail and you want to continue receiving a print version we are very happy to do so -just let us know.